After driving down the steepest mountain to get here, we are early. Another ACSI site and we’re unsure whether they’ll book us in early. It’s only 1pm and a lot of sites like to make you wait till 3pm. Not here, told to go for a walk, find a pitch and let them know where we want to go. 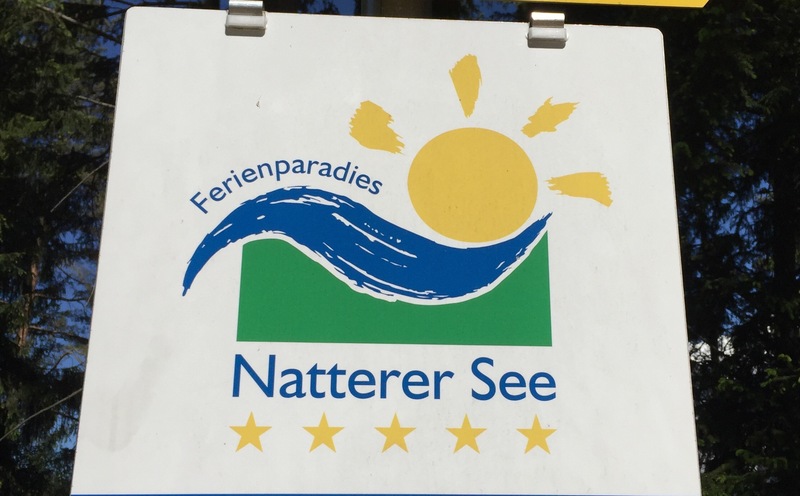 Natterer See In Austria is our destination for today. 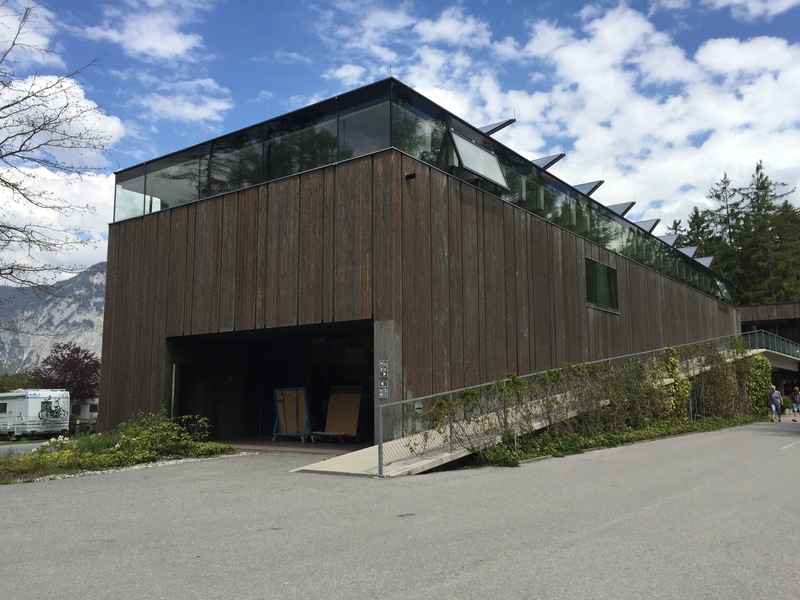 The main building is very ‘Grand Designs’ and ultra modern but fits in perfectly with it’s surroundings. I must point out at this point that this is possibly the best site we have ever had the pleasure of staying on, and I apologise in advance if I appear to gush too much. As part of the ACSI scheme you are entitled to a standard pitch but can upgrade in increments of €1. 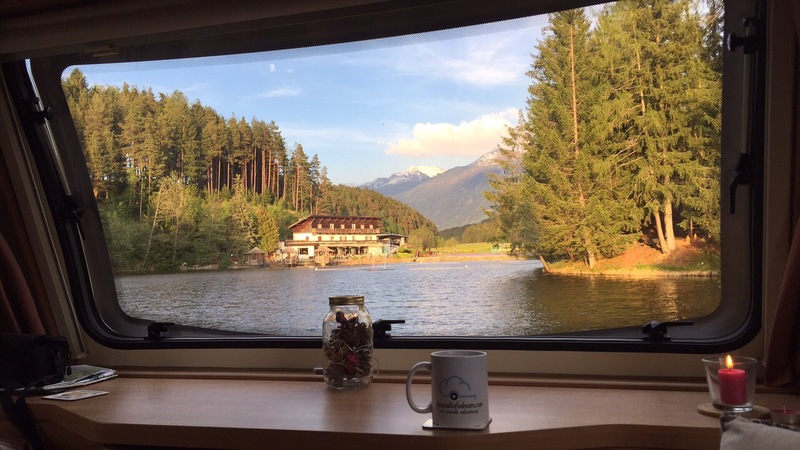 We chose to treat ourselves on this occasion and went lakeside for an extra €4 a night. The grass isn’t trimmed to perfection and daisies are sprinkled liberally but the location of the site, facilities and views are amazing. With an on site swimming lake complete with water slide, who could want more? The site is quite large taking in nooks and crannies of statics, pods, safari tents, EuroCamp and tourers. If you didn’t wander you would be blissfully unaware of anything but tourers. The other guests in other forms of accommodation are squirrelled away for privacy. The touring part of the site is divided by the main ‘Grand Designs’ building. 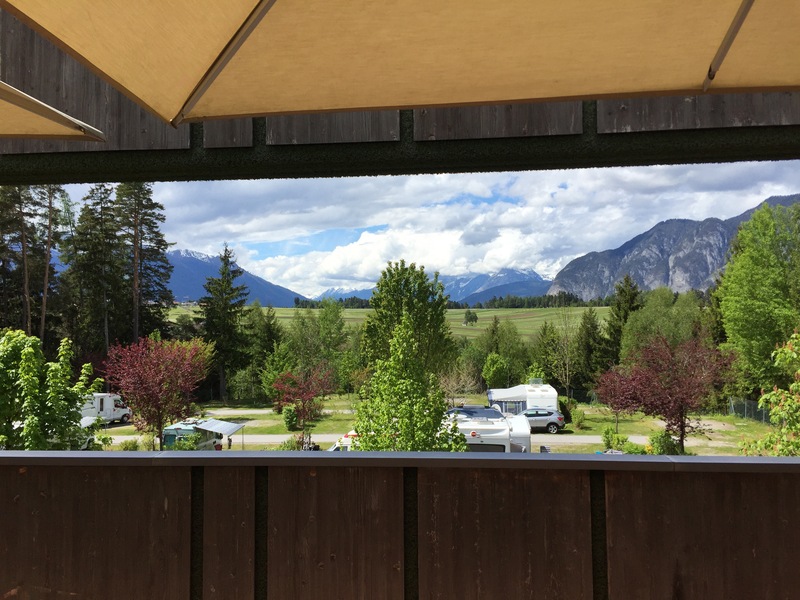 One has beautiful panoramic views of the mountains and the other sits upon a lake which is back dropped by an on site Alpine restaurant and beautiful mountains. A walk around the grounds towards the restaurant, which is open to the public also, reveals parks and playgrounds, some hidden in the woods and some easy to find. 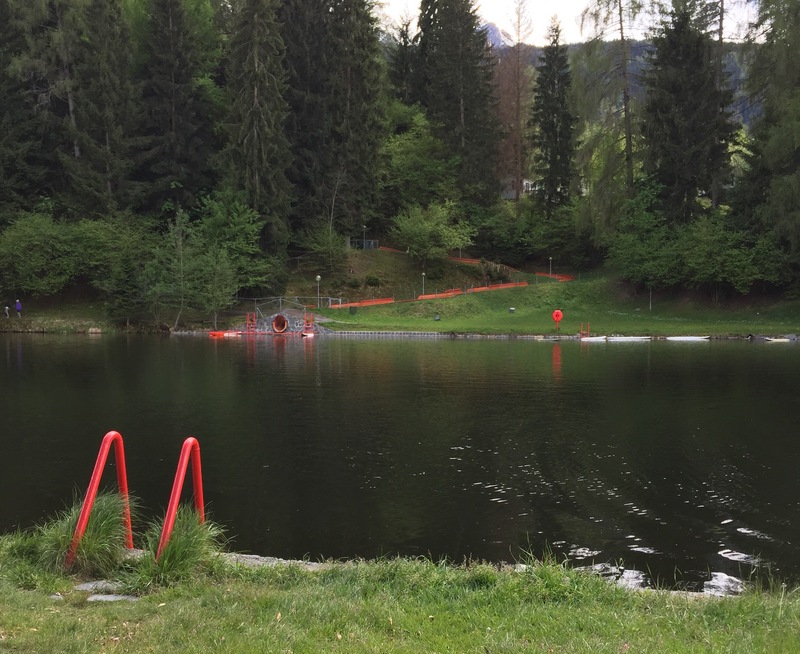 The swimming lake is also open for admission to the public, as a guest you have free access. We found this one slight disadvantage as we saw a few people just wander across from the restaurant for a little walk around the site. The facilities are by far the best we have ever come across. 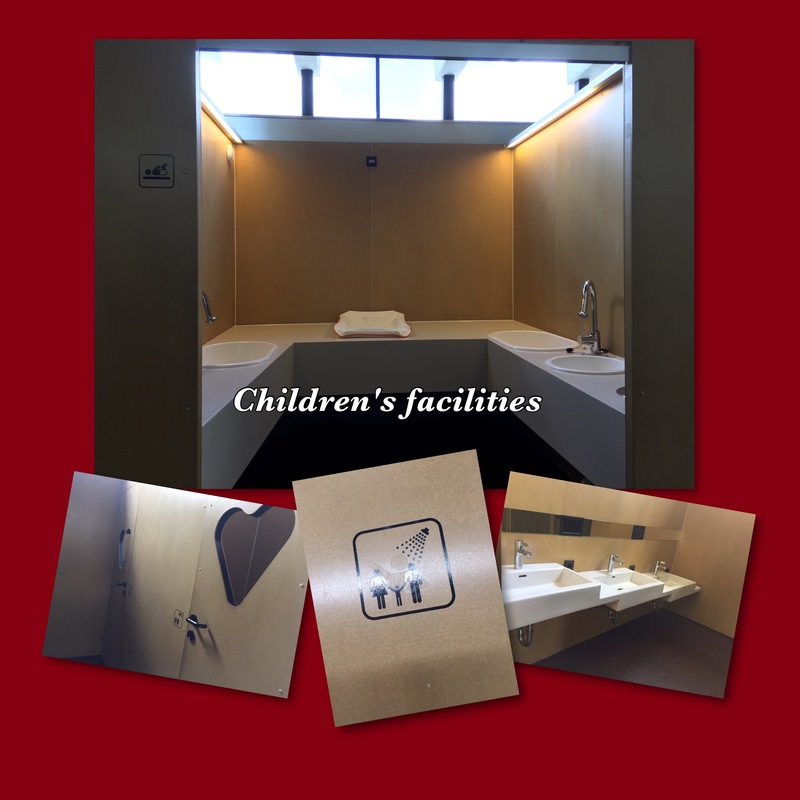 Separate facilities for the children, with smaller loos and sinks and an amazing baby bathing/changing room. 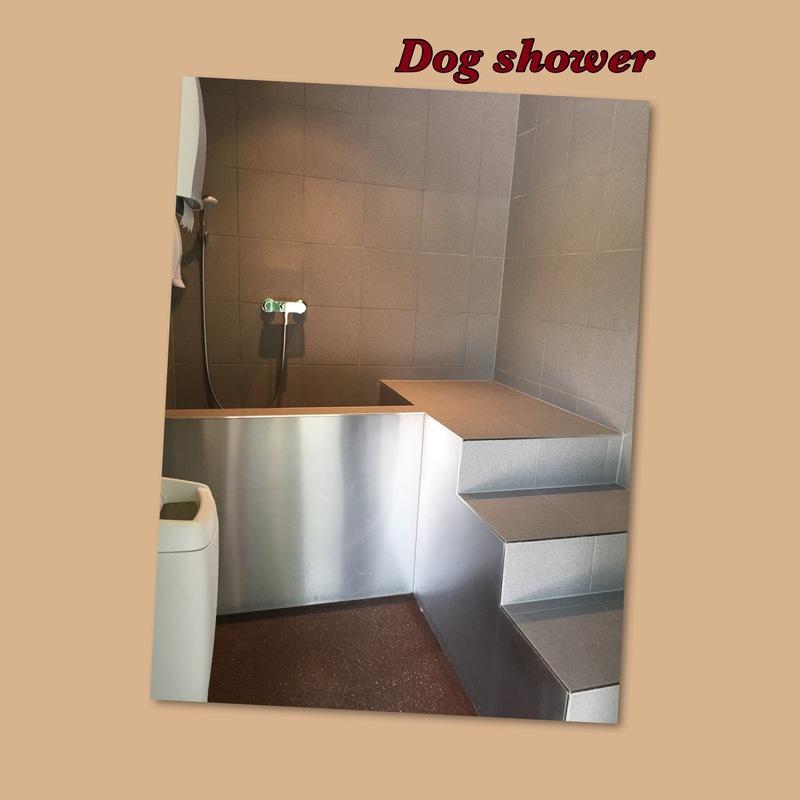 Even the dog gets its own luxurious shower room. The facilities for the rest of us are nothing but palatial. With private bathrooms available at a cost. The facilities for the rest of us are second to none. The block is split into a lower and upper level. With chemical disposal, dog shower, washing up facilities, gents and ladies loos downstairs. Up a sloped ramp to the upper level you enter a communal area containing displays of miniature caravans and Motorhomes, the children’s and family facilities and the gents and ladies shower areas. All doors and walls are bizarrely covered in what appears to be brown and green AstroTurf, which in some strange way actually works and adds to the modern, unique design. Music is played throughout the block, a big thing for me. I love music in public facilities. 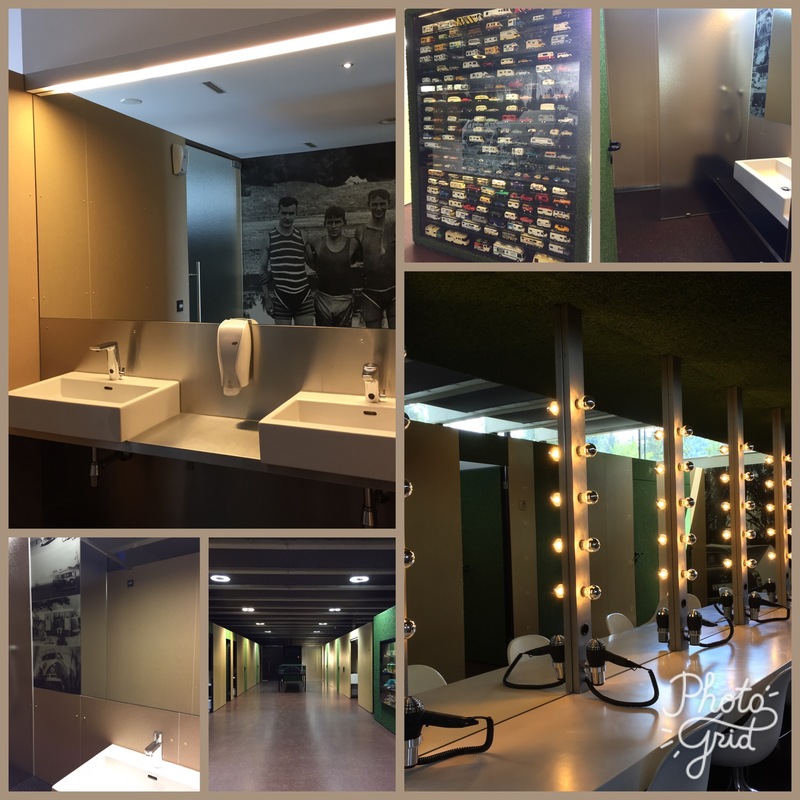 These facilities really do need to be seen to be fully appreciated. Choose to go lakeside and you have a stunning uninterrupted view all day which changes with the time of day and weather. 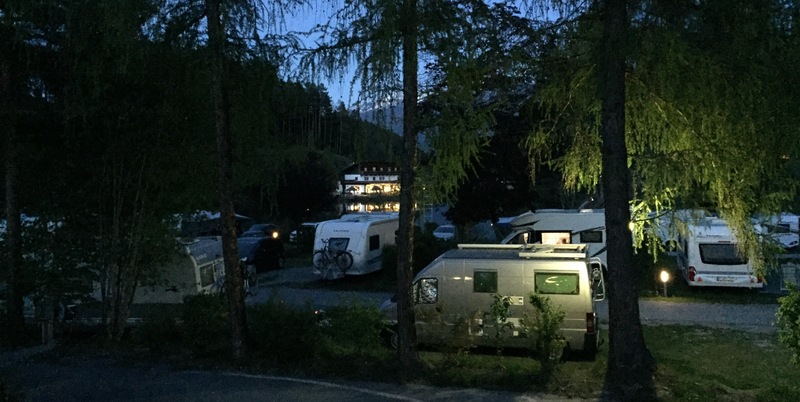 Staying at the site you are allowed to use the bus into Innsbruck free of charge using your site pass. 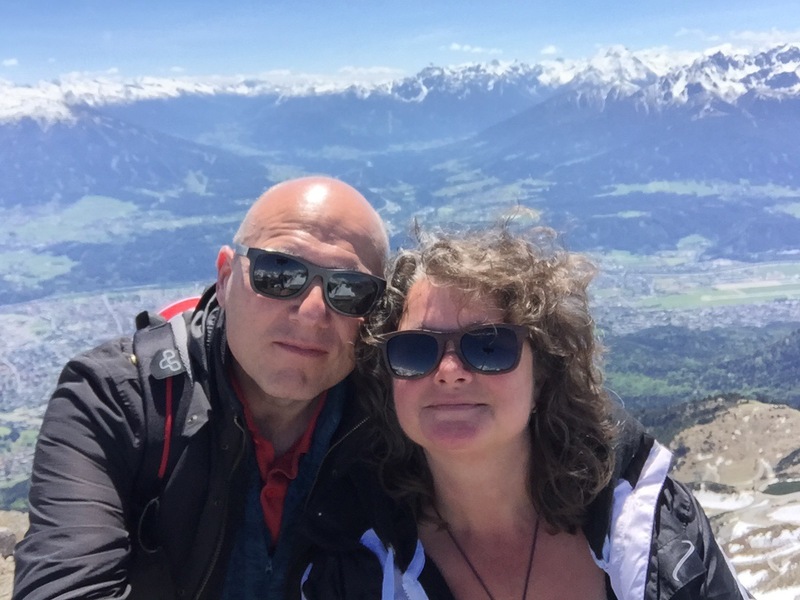 An Innsbruck card is also available to purchase in reception which covers you for entry into a lot of the museums and attractions of Innsbruck including a return trip up to one of the mountain peaks. Looking out over the site towards the lake as night time falls and lights start to twinkle, encourage nothing but relaxation. Price? Everything comes with a price. For 2 people for 5 nights including an upgrade to a lakeside pitch, local tax and green tax we paid €137.50 this did include unlimited use of the bus into town. Not cheap but 5 days of luxury of our birthdays. Negatives of the site are few and far between. The shop is on the slightly expensive side. Wifi is expensive and sold in packages. We visited in May and the local cuckoo chose to sing all day long. The Dawn chorus consisted of a choir of thousands of birds all happy to be alive and living in in such a beautiful place, oh and the frogs, the paths come alive with with frogs late at night. With negatives like these who could resist a trip to paradise? Great review – and of a really great site. Thanks for the pictures which brought back the memories! PS. 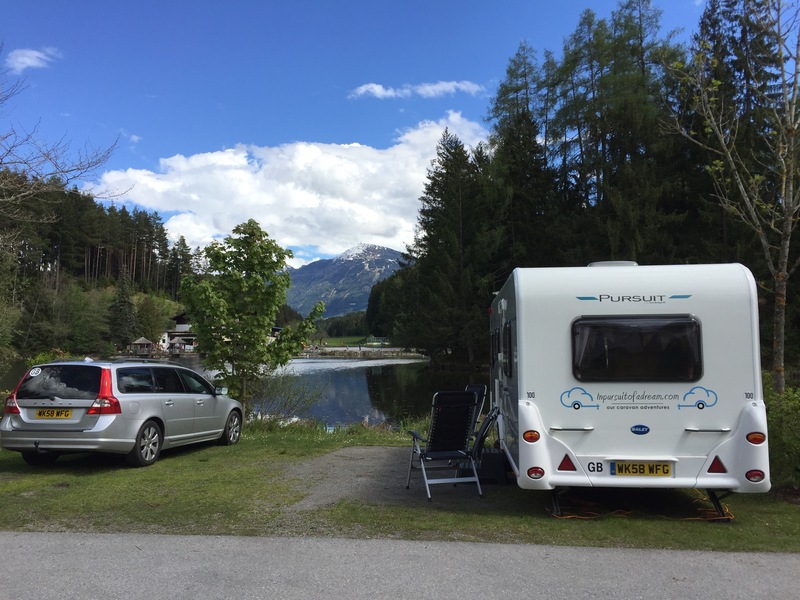 If you haven’t already tried it, try Camping Grubhof at Skt Martin bei Lofer in Austria. 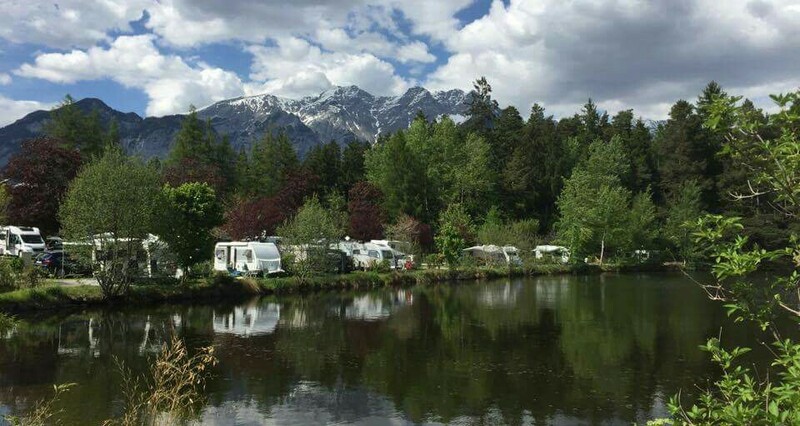 No lake or pool but huge pitches with similar views, ACSI, excellent restaurant with great prices & wonderful cycle paths everywhere – we’d go into raptures about it.